The mass of Jupiter is 1.9 x 1027 kg. It is hard to fully understand a number that large, so here are a few comparisons to help. It would take 318 times Earth’s mass to equal Jupiter’s. Jupiter is 2.5 times more massive than all of the other planets in our Solar System combined. 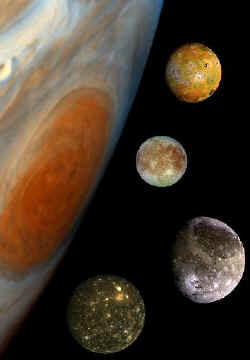 Jupiter is actually so massive that if it gained much more mass it would shrink. How can additional mass cause a planet to shrink? Gravitational compression. Given that there is no more hydrogen or helium gas floating around for Jupiter to collect, it would gain mass through the accretion of rocky bodies like asteroids. Jupiter’s intense gravity would pull additional rock tightly together shrinking the diameter of the planet and increasing its density. As the density increased so would the gravity, further compressing the planet. Scientists estimate that Jupiter would have to accumulate 3-4 times its current mass in order to begin compressing. Since there isn’t that much material in our Solar System, it is a pretty good bet that Jupiter will never shrink. But what if it did? There have been rumors floating around for decades that Jupiter could ignite fusion and become a star at any time. They are all false science and garbage at best. The mass of Jupiter is no where near enough for sustained nuclear fusion. Fusion requires high temperatures, intense gravitational compression, and fuel. Jupiter has the right fuels in abundance. There is plenty of hydrogen to be had, but the planet is too cold and lacks the density for a sustained reaction process. Scientists estimate that Jupiter needs 50-80 times its current mass to ignite fusion. As stated in the paragraph above, there isn’t enough material to be had, so Jupiter can not become a star. As you can see, the mass of Jupiter may seem awesome in comparison to Earth, it is a tiny fish in a world of sharks. Scientists have found a few hundred gas giants larger than Jupiter as they have surveyed the night sky. Who knows what is in store as telescope technology improves in the coming years. Here’s an article from Universe Today explaining just how big planets can get, and an article about how Jupiter and the other gas giants might have gobbled up their moons while they were forming. This site has more detailed information about the mass of Jupiter, and a page from NASA that helps you calculate the density of the planets.